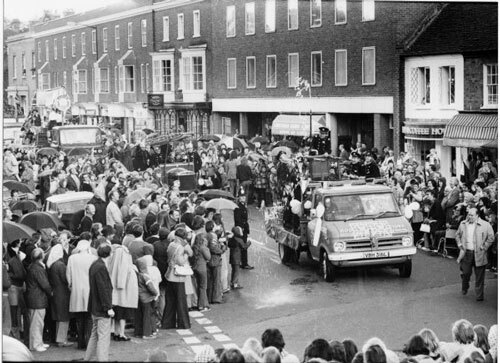 I found this photo, which shows the Vienna Coffee House at the bottom of Marlow High Street during a 1977 carnival, online at “Saving Wycombe’s Old Photographs,” the source of several photos of Marlow included here. This one was taken by Paul Felix for The Bucks Free Press, the perennial local newspaper. The Vienna is long defunct, although in 2008 the space is still a restaurant. The Mini was inexorably linked to earning money. Mum and dad had bought it and paid for its maintenance and insurance. But petrol was my responsibility, and petrol was far from cheap. It was a relatively simple equation: if I wanted to go places, get the most out of this wonderful liberating machine, then I would have to earn more money. Petrol, cigarettes and booze can add up. It was a classic equation, a monetary embodiment of dad’s peculiar mantra, another of his frequent sayings: I could not have freedom without responsibility. Philosophically speaking, I thought that the conjunction made no sense and told him so. It was an oxymoron. But having the responsibility of earning money to enjoy the real practical freedom that the Mini offered made perfect sense and gave me no problem at all. 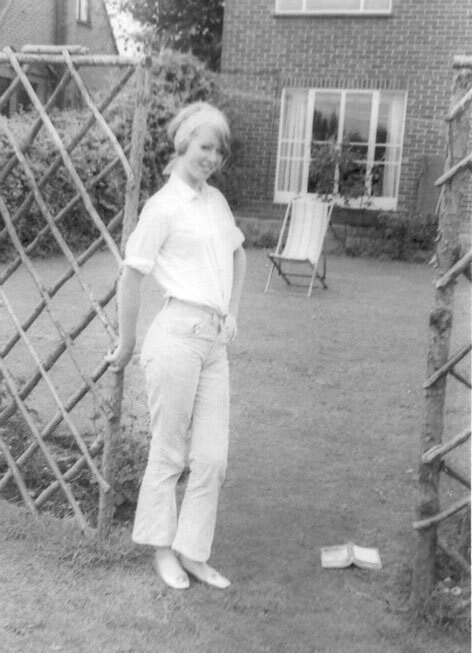 I had started working to earn money in 1968, aged 15, way before the Mini, but not before cigarettes and clothes had given me cause to want more money. Of course, it had to be done in such a way as to avoid interfering with my all-important school work. My first job was washing dishes on Saturdays for Bruno and Guido in the Vienna Coffee House at the bottom of Marlow High Street. No dishwashers then, just a high power spray hose in the stainless steel sinks. Hard and monotonous work, but it gave me real money to spend on music, clothes, cigarettes, and the pinball machines in the West Street café. All right, so that money did not buy all those adolescent requirements, at least not all at once, but the principle of the value of having my own money was already established when the Mini arrived. That dishwashing job didn’t last too long, although I can still taste the sweet toasted teacakes, with butter dripping through them and over their edges, which were my favorite dish at the Vienna Coffee House. I found a promotion (or did mum find it? She was certainly helping me enter the world of work) to being a waiter at the White Swan Café at the top of Marlow High Street. My employer here was Mrs. Pickles, always described as the divorced wife of the Lord Mayor of Liverpool, although that sounded unlikely even at the time. She drank like a fish and seemed to constantly alternate between merry, incapacitated and tears. Only her daughter kept the place turning over, with the help of us boys, of course. Scott Purser had a job there too. Not having many pictures concerning work, I’ll use this chapter to include some of Sue. 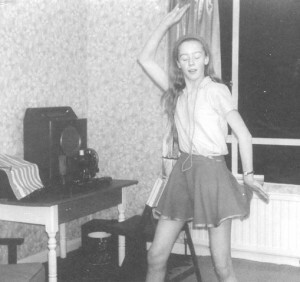 Here she is at 12 or 13 dancing to our transistor radio in front of the mirror in the spare bedroom. She would disappear in there for hours, rehearsing the moves that would appear on the dance floor a few years later. “Come dancing, that’s how they did it when I was just a kid, and when they said come dancing, my sister always did.” Written by Ray Davies, performed by the Kinks. A teenager working at an early job needs understanding customers. I liked Americans, because they enjoyed talking and were very open compared to the average English customer, and they did not hurt their cause by tipping well. I was serving a large American family one day at the big oval table in the White Swan’s bay window. There must have been seven or eight of them, and they were friendly and engaging and all ordered something different and without regard to price. As I was handing out the drinks, I jerked forward to try to stop one of the children spilling his, and the whole tray went crashing down on to their table, immediately awash with a cocktail of coke, orange squash, coffee, and I don’t know what else. They were so kind and understanding, helping me clean up the table, not complaining about the drips, or should I say flows, onto their own clothes. The service was perfect until they left, and they remained as engaging and friendly. But you could have knocked me over with a feather when they left the biggest tip of my young life. I worked part-time at the White Swan for years. By the time I left Borlase’s, in July of 1970, I had taken whole days off school once or twice a week for months in order to work there. This was not allowed, of course, but did enable me to earn real money. Ernest Hazelton must have known about it, but he let it go. If he had pushed me to come to school every day and stay there, I might have decided to earn money instead. I was a borderline student during the last two years at Borlase’s, from September 1968 to July 1970. In addition to taking time off to work at the White Swan, I spent mornings some days and afternoons others playing the pinball machines in the West Street Café. Earning money was the key goal by the time I finished school, and I’d already learned that I would need to earn it myself. Mrs. Pickles wanted to look after her boys, and at times went out of her way to help us out. She was not entirely predictable, because of the constantly varied effects of the alcohol. Generally, she tended to be kind when we messed up, which occurred fairly frequently, still showed confidence in us which we barely merited and which we rarely saw anywhere else, and from time to time she shared a dram with us. Which brings us to a Christmas story, complete with fish. As childhood turned into adolescence, the thrill of Christmas evolved from presents, Christmas trees and the family to parties, drinks and girls. The Christmas of the White Swan was shaping up well. Customers were filled with the holiday spirit as they tipped, Scott and I had a lot of work during the school holidays before Christmas, and there were plenty of parties on the horizon. We worked all Christmas Eve, a hectic day of last-minute preparations for everyone in town, it seemed. Mine were a couple of errands for the family along the High Street during my break. I bought fillets of cod for the cats. We couldn’t have Pickle and Ginge going without their favorite food over Christmas, now could we? Here she is vamping a little in around 1968. She was about 14. The “girl” stuff seemed to come easy for her, but maybe that was just the tortured impression of a boy for whom the boy stuff came with great difficulty. I built the lattice behind her for dad to grow some climbing roses. He loved his roses. At around 5 pm, Mrs. Pickles decided to shower us with her version of Christmas goodwill, beginning with an offer of a drink. She was already well gone herself. Christmas and alcoholism seemed a match made in heaven. Well certainly, Mrs P., thank you very much! Served in a 12 ounce coke glass from the café for each of us, the first drink that she brought us was straight rum. The glass was over half full. The second was again over half full, but this time had perhaps a little coke, for flavor. Mrs. Pickles had probably realized by the second drink that normal people, especially normal people of our age, did not drink neat alcohol. But that second glass was again mostly black rum. Scott and I gamely sat across from each other at a little table somewhere in the living space above the café, not even realizing what was happening, and effortlessly drank ourselves silly without quite knowing it. We had rarely if ever drunk any hard liquor at this point in our lives, contenting ourselves with the sin of beer, which was perfectly adequate to give us that pleasant loose feel of alcohol. With the rum, life very quickly became one big giggle. We arranged to meet later at the party, and I grabbed the cod out of the fridge in the White Swan’s kitchen, jumped on my bike, and started off for home. It was snowing. But that was not the principal reason that the ride home, which I had only done several hundred times before, was so eventful. The cod was wedged under my jacket, somewhere around my waist, so that both hands were free to hold the handlebars, but it was still surprisingly difficult to ride. I attributed the difficulty to the cold. I rode that route back home almost every day and no matter where I was returning home from. It was second nature. The first part of the ride home was flat and on little-used roads, which made it easier. I had plenty of wobble room. But things became more of a challenge on the footpath past the cemetery. It felt surprisingly narrow, for one thing, with the hedgerows on either side constantly seeming to jump out. I dimly realized that this was not possible, and decided that it was an optical illusion generated by the snow. That seems a perfectly logical determination at the time. One section of this footpath was unpaved. Coincidentally, that section climbed uphill, and was the steepest part of the ride home. In the snow, it became impossible to surmount. And my trusty bike became impossible to mount. I fell flat on my face on the same piece of dirt about three straight times. Starting off a bike uphill is not easy at the best of times. In the settling snow on a dirt track with fillets of cod to carry, it became impossible. After some time for reflection, I bravely accepted the inevitable, picked up the fillets that had somehow slipped out from under the jacket on to the path, and began walking the bike up the hill. I fell again after a few steps, and was beginning to feel a little worried. What was going on? Was it that icy? Why was I slipping and sliding like a silent film star? By a superhuman effort, involving a kind of concerted triangulation among my legs (one point) and the two wheels (the other two points), I stayed on my feet up the path and back on to the road. It seemed politic to continue walking the bike, even though I was now going downhill on a wide road. I duly arrived home, walking the bike beside me as a kind of Zimmer frame. Naturally enough, boyfriends began to appear. 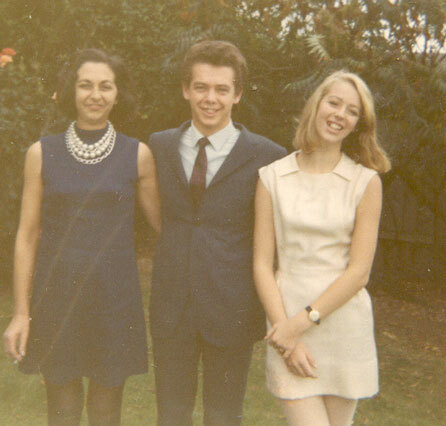 Here she is with Godfrey and mum in 1969. Mum is 42 here and Sue 16. 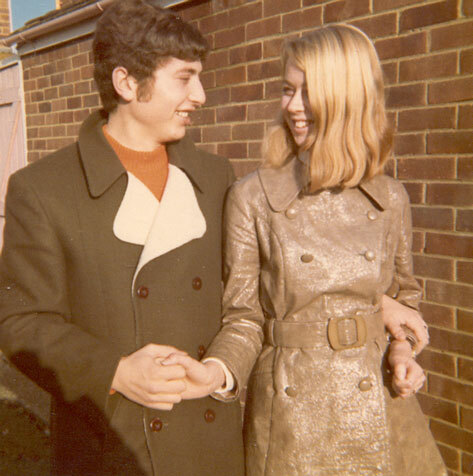 Mum approved of Godfrey, who took Sue for drives in his car and habitually wore a jacket and tie. Note the cigarette. I rang the doorbell to avoid figuring out how to find the key, keep the bike upright and pick up the cod at the same time. How had the fillets fallen on the ground again? Mum looked at me strangely when she opened the front door, but I thought that it was just because I was collecting fillets of cod off the ground in front of her. I explained that they had managed to worm their way out of the paper that the fishmonger had wrapped them in. She laughed again. All very confusing. I didn’t see the humor. Didn’t she see the challenge involved in riding a bike home in the snow while carrying fillets of cod? As I walked past her she took a step back and brusquely admonished me for stinking of fish. I thought that was unfair, and glared at her: “you try riding a bike home in the snow with fillets of cod under your jacket.” I could sense it was a good argument, and followed up by telling her that I was going to a party. Might as well establish the ground rules up front. She told me, still with laughter in her voice, that I would need to take a bath first. I had to admit that did made sense. Who wanted to try to pick up girls smelling like cod? No, try again: “who wants to smell like cod when trying to pick up girls?” I duly headed for the bathroom, undressed, ran the bath and heaved myself into it with a big splash. I remember that splash! I woke up the next morning feeling very sprightly. How I had ended up in bed? Had I gone on to the party? No. It transpired that having made it into the bath, the remainder of the process had escaped me. Rather than wash myself, I had promptly thrown up again and again before passing out in my own bath water. Dad had wanted to leave me to stew in it, to teach me about the evils of alcohol, but mum had talked him out of it, something about the risk of drowning. He had begrudgingly rinsed me off and put me to bed. With the alcohol all gone already, I slept the sleep of the just, and my only regret in the morning was missing the party. Merry Christmas! I can thus date my very first drunken adolescent binge: December 24, 1968. I had just turned 16. Working at the White Swan helped teach me one of the things I needed to look for to enjoy work: lots of human contact. I felt so locked up inside myself so much of the time, so lonely and misunderstood. But here I liked the people I worked with, Scott Purser, even Mrs. Pickles. How could anyone not appreciate a well-meaning alcoholic named Mrs. Pickles? Generally, meeting new people was not as easy as it had been when I was younger, but in the White Swan I met new people every working day. The initial wall of reserve was definitely built lower, if it hadn’t been entirely removed. This was still suburban England, after all. I regularly chatted with customers about more than the menu and orders, and sometimes even had long and interesting discussions with total strangers. Loved that human contact! Whether human contact works or is efficient or ultimately accomplishes what it promises can easily be debated. But Geoffrey Milligan (not his real name) walked up the High Street one winter’s day in his sunglasses, knowing that he would find us working in the White Swan, and taught us something about human contact. Geoff was pretty tough. He knew a lot of people in town, and was respected. I had wandered around with him some evenings. He would lead me from pub to pub, and was served in every one. All the bartenders knew him and served him, because he looked older than he was and because he was on their level somehow, more mature than his age. He was a year older than us, but circulated in town as if he was five years older. I had no idea where that came from. He introduced me to Old Tom, the boatman who worked in the boathouse next to Marlow Bridge. The three of us would sit there in front of the boathouse watching the river flow by at night as Geoff and Old Tom chatted. At least two boyfriends followed her back to Marlow from Italy, where she had met them on the beach during family summer holidays. This was Paolo, visiting during 1969 or 1970. Walking up the High Street that day to the White Swan, away from the dark water of the Thames, swirling under the bridge and over the weir, Geoff was wearing sunglasses to hide the tears in his eyes. I don’t remember the details, but will never forget what he told us that awful day. His mother had thrown herself into the river from the roadway across Marlow Bridge. I never thought about mortality, but I thought about it a lot over the next few weeks. Needless to say, Geoff was distraught. He didn’t say much. He never did say much. But when the worst thing that could happen to him happened, he came to be with friends. I never understood his mother’s suicide. How can anyone understand a mother’s suicide? She had two teenage sons, kind boys, bright boys, interesting boys. Apparently her husband kept himself to himself, and England still felt grey in the sixties. It was a long, cold winter. But nothing could explain how much she must have hurt: how she must have hurt! I thought about the preparations that she must have made: did she leave a note? Had she explained why in any way to her husband and sons. I thought about how she accomplished her goal: after she dropped ten feet and splashed into the river, how did she force herself to sink under the water? Why didn’t her body take over her screaming mind and resurface instinctively? Had she weighed herself down with rocks to overcome that instinct? Or had she in fact instinctively fought for life after that first dreadful jump? She seemed to have taken it all so seriously, and acted so deliberately. What could we say to Geoff? I remember making sympathetic noises, and feeling so bad for him, but how could I ask the real questions without evoking something that he might not want? How could the real problem be addressed? What made her do it? How could she have left her own children alone to deal with what she had done? I don’t know if I ever told him the one thing that I kept thinking: it was nothing to do with you, Geoff. You were the victim as much as your mum. Of what, we’ll never know, but it wasn’t you or your brother. Geoff wasn’t there to ask us those questions, of course, or to hear any words of wisdom or platitudes. He was there because the only thing that he wanted at such a mad and empty time was a little human contact. He might not even have known it: I certainly didn’t realize as he sat there drinking a coffee with the tears still running down his cheeks. But that is what it was all about. I found more human contact in the next job, a summer job as a retail salesman at a men’s tailors on Oxford Street in London called Horn’s. I don’t remember when or how this job came about, or even when the job at the White Swan ended. Something tells me that the café closed. Horn’s was a very long way from home in Marlow. Perhaps I found the job in the London evening newspaper. I don’t think that I could drive the Mini up to town, perhaps because the cost of petrol and parking would have taken much of what I earned. I do think that I could drive, because I worked at the Swan full time on regular school days during my last year at Borlase’s, and so I had that job until early 1970, after the Mini appeared in the garage. 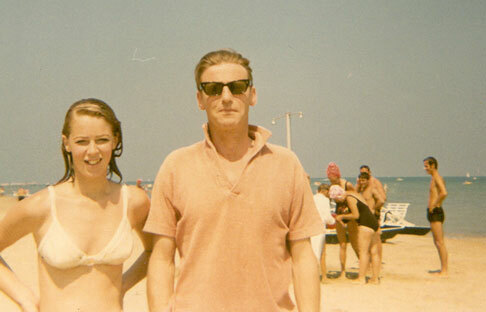 Sue and dad on the beach in Pesaro, I think in August 1969. He does not look at all happy, but having stayed in England I don’t know the details. Dad drove me to work at Horn’s when he was working at his office, which was just off Oxford Street the other side of Oxford Circus. But he wasn’t there every day by any means. I don’t remember how I got to work by 9 am when he was away on business, but it must have been a real challenge to get to the station in Marlow early enough. Or maybe I thumbed some times. It wasn’t that difficult a trip, especially wearing decent clothes, across Marlow Bridge to the M4 outside Maidenhead, and then normally one ride straight into town, or at least far enough in for me to take a tube the rest of the way. The motorway began at that roundabout outside Maidenhead, and there was always a steady stream of bored commuters driving by. I was obliged to dress relatively neatly to work at the tailor’s, although longish hair was tolerated if appropriately groomed. Grooming was an art which escaped me, but I got by. I rather liked clothes. As an up and coming hippie, I admit this hesitantly, but one of the reasons that I liked to earn money was to be able to buy the occasional cool clothes. It was around this time that I found the light tan suede trousers that I would wear for years, on the King’s Road in Chelsea, I think. They were fabulous. Mum patched them up many years later after they ripped, and they still looked great. I wasn’t a clothes horse: most of what I wore was cheap and basic. But the occasional flashy item of clothing was a real trip. Horn’s, a more traditional tailor, did not offer the opportunity to locate such interesting clothes. Suits, sports jackets and ties, dress shirts, and the odd frivolous sports shirt were their stock in trade. Besides, I was there to sell, not to buy. Dad had already let me know that with my “gift of the gab,” I should have a career selling. He was in personnel work, and ought to know. This was my first real taste of what selling meant. It’s possible that we decided on that job for me to give me that first taste. There certainly wasn’t as much money in selling in a gentleman’s tailors as there was in waiting on tables. Even in England, tips were a very useful and tax-free income supplement. around on my own train spotting at 11 or 12 years old. As I got older and scruffier, people were more nervous about my engaging them in conversation. I regretted the change. At the White Swan, I could always chat with my customers at their tables, and at Horn’s I could chat with anyone who walked in. It was the chat and not the selling that made the job for me, but the selling gave me a reason to chat.